“Bone Head” is Harmony Kingdom’s first dinosaur themed box figurine. Our favorite master carver says he wishes he roamed the earth during the age of the dinosaurs but that would make him at least 65 million years old and probably a bit shaky on his feet. 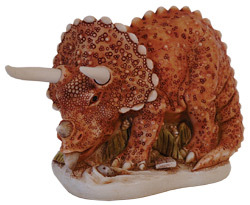 Peter’s triceratops is bemused by a meteorite landing at his feet. Was this the meteorite that caused dinosaurs’ extinction? The triceratops has trodden on a sign that reads “Hell Creek”, a rock formation in North Dakota that is rich in dinosaur discoveries. The hidden mouse has also turned up, just checking that his stand-in, the snake, is doing its job properly. Peter began carving “Bone Head” on his birthday, which is inscribed on the beast’s belly. A month later, he added the finishing touches while his son Sam was celebrating his fifth birthday, commemorated on the box’s lid. Peter imagines that the reason there are no photographs of dinosaurs is because they ate all the photographers, so his triceratops’ interior is full of cameras.